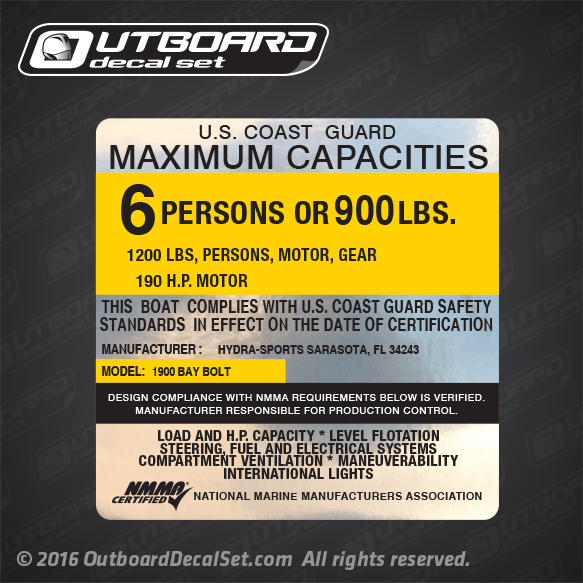 Hydra Sports Boats Capacity flat vinyl decal for 1900 Bay Bolt models. Printed with Silver Metallic Inks (chrome). 6 PERSONS OR 900 LBS. DESIGN COMPLIANCE WITH NMMA REQUIREMENTS BELOW IS VERIFIED. MANUFACTURED RESPONSIBLE FOR PRODUCTION CONTROL.